Nail Length 1-3/4" - 3-1/2"
Nail Diameter .099 - .131"
The NV90AG 3-1/2" coil framing nailer packs both the driving power you need and the convenience you want into one, surprisingly lightweight package. It is capable of handling a variety of tasks, driving nails from 1--3/4" x .099" to 3-1/2" x .131". Coil framing nailers are not known for their compact designs, but this coil framing nailer weighs in at only 7.7 lbs with a head height of just 13-1/6". Equipped with a steel head plate for increased durability, this nailer can handle any jobsite need.The NV90AG 3-1/2" coil framing nailer packs both the driving power you need and the convenience you want into one, surprisingly lightweight package. It is capable of handling a variety of tasks, driving nails from 1--3/4" x .099" to 3-1/2" x .131". Coil framing nailers are not known for their compact designs, but this coil framing nailer weighs in at only 7.7 lbs with a head height of just 13-1/6". 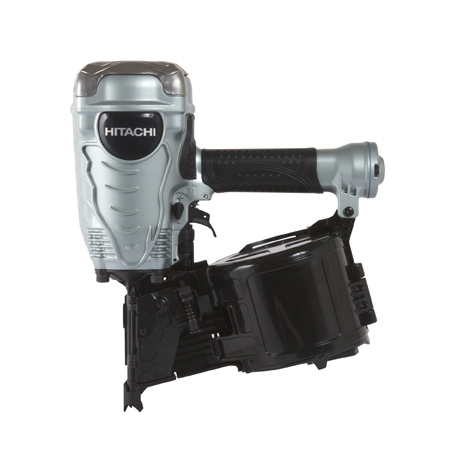 Equipped with a steel head plate for increased durability, this nailer can handle any jobsite need. Large nail range capable of driving nails from 1-3/4" - 3-1/2"